The landscape around the studio. A great benefit in handling Art is meeting working Artists. I get to see what they make and for a short time interact with them in their studio, home and gallery. I'm always respectful of the work and seek to understand what I should do as if it were mine. Personal care along with critical distance can give insights, from where to touch the most fragile object to where to place rigging straps on a two ton sculpture to be picked by a crane. Most times, I'm surprised by these meetings. Because I specialize in what can be difficult, I'm asked to assist on truly amazing Art projects. Recently, Martin Puryear asked me help on his most recent exhibition at the McKee Gallery in NYC. I met Martin Puryear while I was an Art student at the U. of Md. I was still green and didn't know much, if anything. He was a teacher there and friends who studied with him spoke highly of his teaching method. I was never his student but my sculpting teacher, Ken Campbell told me he was the real deal. He had yet to receive his notoriety but I could tell he was serious with ambition. I remember attending a lecture he gave on Constantine Brancusi. Brancusi was an early hero of mine and I studied his work for clues. Martin spoke with authority/ clarity. It was a great talk with slides. Pictures of the Artist working, descibed by a working Artist was a great treat.Some of the things he hinted at, like scale and scope, I am still working on today. 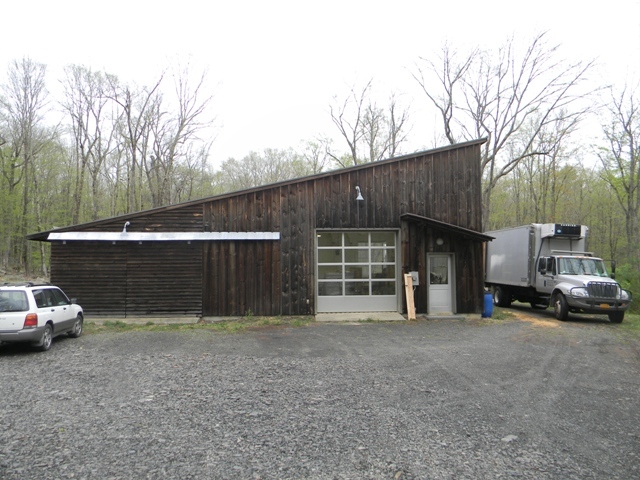 I drove up to his studio in upstate NY and even though I had been there before a few years earlier, on another project, I got lost. He lives off a County Rd. that was not easy to find. I made the mistake of googling his address, relying on an iphone app and guessing. Finally I had to call him and he steered me in. It was great seeing him again and being in his studio. Sometimes it's easy to forget what Art is about. Whatever it is he has it. 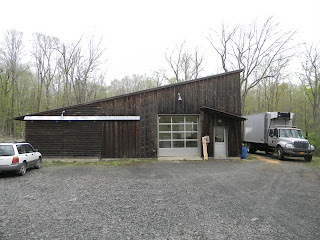 The first thing I noticed was one of his sculptures was hanging in the air strapped to a chain fall attached to an overhead i-beam bolted to the studio trusses. "That's new," I said. He smiled and told me something like he was still learning. We were there two days packing his sculptures. 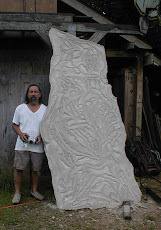 Along with his studio assistants I worked alongside a team from Artex, Inc. They had driven a truck filled with materials and their best packers. It was great fun. Everybody was generous and team oriented. On the third day two trucks came to load and deliver to the Gallery. We now had three trucks total. We filled each box truck with sculptures and in the end took out tape measures to see how it would all fit. I was only obligated to help in the packing phase of this project, contracted to make sure everything was good from the studio to the truck. Others would be responsible for the rest. Several of his sculptures were large and heavy. We struggled to get the largest sculptures into the trucks. In the end it was all safely packed and ready for transport. As we were saying goodbye, I felt a real concern about the delivery and installation. The dock door to the gallery is on 58th St. and 5th Ave, NYC. This is among the most difficult places to unload a truck anywhere, let alone three. The largest sculpture had to be rigged for installation. 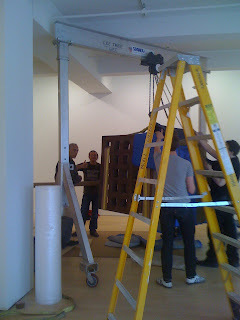 A gantry would be provided but it was up to the team, along with the gallery technicians to install it. I was a little worried and I asked Martin what he thought. We had a short conversation and I told him not to worry, I'd be there in the morning to make sure the trucks were unloaded and I would help install the sculpture which needed to be rigged by the gantry. With Martin Puryear rigging his sculpture. Transporting some kind of sculpture and other works of art needs more proper handling than with fragile objects. It needs utmost care as not to mar the perfection of every piece. Anyway, it's good to hear that you got a group of packers that are good on handling these. So, what happened right after?